Whether your kids are old enough to stay up until midnight or so little that you celebrate early in the evening, here’s a round-up of fantastic kid-friendly New Year’s Eve party ideas that everyone will enjoy! Set up a hot cocoa bar, cupcake decorating bar, or ice cream sundae station. Make buffet-friendly dishes that everyone can enjoy. Make cupcake fondue (it’s a no-heat fondue, so it’s safe for all ages). Toast with sparkling grape juice or sparkling cider, or make kid-friendly mocktails. Make New Year’s confetti clock sugar cookies. Cover drink bottles in confetti to make them fun and pretty. Make a New Year’s Eve cookie tray. Serve treats from glittery styrofoam ball holders. Wear party hats made from leftover Christmas tinsel. Decorate your food with sparkler toothpicks. Make a giant 2014 out of balloons. Hang a DIY balloon drop and let it go at midnight. Drink out of DIY glittered glasses. Hang up a sparkly ball piñata and break it open at midnight. Spread colorful bubble wrap on the floor and let the kids have a blast popping the bubbles. Make shakers out of empty water bottles. Make and decorate raisin box shakers. Let the kids bang metal pot lids together, or hit pots with wooden spoons. Make a New Year’s bell from a tin can. Make a tinsel ball and use it for your own ball drop. Create a family time capsule like this or this. Count down the hours with a paper plate clock. Make a family New Year’s resolution poster. Make a New Year wishing wand (your little one can use it to “grant wishes” for the New Year). Open surprise ball fortunes filled with New Year’s predictions. Set up a photo booth with simple props and take pictures. Have a New Year’s Eve scavenger hunt. Make an hourly balloon countdown and mark each hour with a fun and easy family activity. Make confetti tubes, and throw the confetti at midnight. Color New Year’s coloring pages. Start a blessings jar that you’ll use all year. Make Happy New Year pancakes for breakfast! 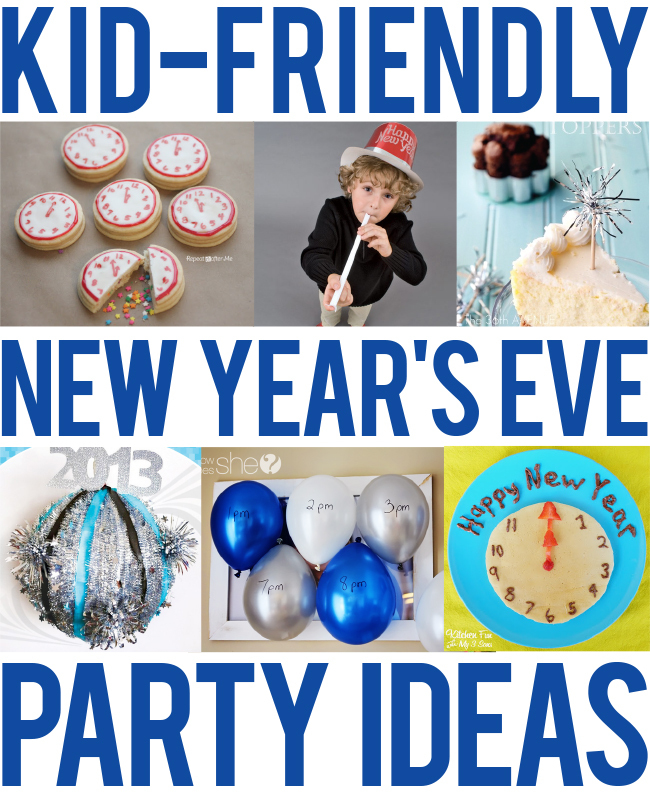 For more New Year’s Eve party ideas, click here! Great round-up, Heather! Always love your finds! Great ideas! Thanks for sharing with us!